Twenty development professionals recently met in Bangkok to ask, “How Can We Build the ICT4D Capacity of Development Organizations?“. They discussed the usage, implementation as well as the successes and challenges of building capacity of development organization to make use of ICT in their work. The lead discussant, Simon Gee from TechSoup Asia, started the discussion by talking about how they work through local partner networks to build ICT4D capacity, although he noted how in some countries they have found it hard to tie down a local NGO partner that a is good fit for that role. The discussion then moved into the group, which explored how ICT4D has been implemented in the development sector and within specific development programming. Participants acknowledged that results had been patchy and that there were specific issues in the development sector that contributed to challenges with building the capacity of organizations to implement ICT4D. These issues went beyond the belief that the development sector is just generally lagging behind the private sector. 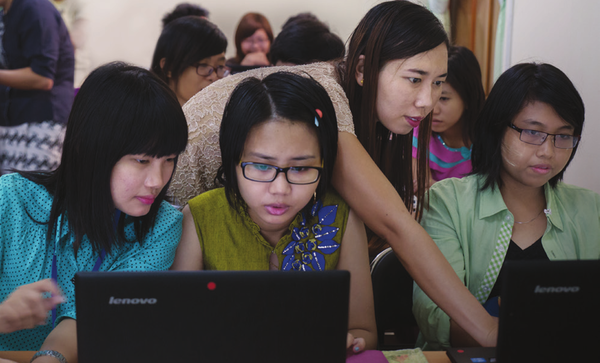 A deeper understanding of the structural issues and barriers that organizations face needs to be understood before ICT4D can be successfully used as a tool to enhance development in low and middle income countries in Asia Pacific. Specifically, the discussion focused around five core factors that are contributing to limited ICT4D capacity among development organizations in the region, as well as some ideas for how to address those issues. People in less developed countries use and adapt to technology differently. We need to understand how they are using existing technology. In countries such as Myanmar, there can be a trust deficit with IT. There can be issues around transparency and the way people perceive technology. In some cases, the concept of transparency and open feedback in general is not a given, due to historical context in some cultures. Therefore, there needs to be constant trust building alongside implementation. Unless there’s a commitment to develop something and work with the community to implement it, then there’s a concern about sustainability. This can be addressed by meet-ups, creating Facebook groups and by developing a community where people can support each other. NGOs are fatigued – there have been too many examples of putting technology in and it doesn’t work. We need to build momentum, test products and ascertain the best usage of the products. Social media such as Facebook, that is widely used, needs to be implemented to get people interested in ICT. Some successes have been shown using social media to support ongoing user groups before and after technology has been implemented. This is driven through a shared and social experience, rather than top down. Need to address the skills gap and the gap in knowledge of ICT4D – this is both at the local level as well as within NGOs and international development organisations. There are incredibly innovative people in developing countries and these people are best placed to understand the issues and the challenges that are faced, in both a development context as well as an ICT4D context. These people need to be nurtured and supported. The question is, how can we tap into the next local generation? Technology needs to be developed with the challenges of the infrastructure in mind. There’s a need to recognize the importance of ICT products that work offline. You can’t assume that you’ll always have access to the internet, WiFi or that you’ll even have electricity. Data collection can be a challenge – the use of tablets – and the ability to charge them pose challenges. People often revert to pen and paper as the default. There are lots of problems trying to adapt new technologies that have been designed for highly developed countries. While the software may be donated for free, many small, local NGOs worry about maintenance and associated ongoing costs, especially in less managerially experienced organizations. Technology needs to be adapted to be used in agricultural sector, as it’s such a huge and important sector in the ASEAN region. The agricultural sector is very traditional but is a key industry to target. In middle income countries like Thailand, donor-driven capacity building has passed and we’ve now moved more towards social enterprise. One participant mentioned the co-location facilities popping up over Thailand, which are focused on social innovation rather than for profit start-ups. There was concern about the need for donors to see clear, time-sensitive results and the monitoring and evaluation of projects. There was a discussion about the difficulty of measuring impact in many ICT4D projects and the need to look at measuring outcomes and results differently. This post was written by Anneliese McAuliffe.